There’s only one way, that I know of, to gather over 1,500 adult advocates, experts and professionals in the same place for a solid four days to discuss their common livelihoods, passions, experiences and discoveries. A conference. And as we know, almost every conference has the lovely exhibit hall – the area attendees love to hate and hate to love. Far too often, attendees feel like vendors are trying to sell them something (whether they need it or not) when actually, there tends to be a wide variety of excellent resources available running up and down those aisles. And if they’re lucky, sometimes there are relatively decent freebies, as well! Recently, Knowledge Services attended and sponsored the 2016 Home and Community Based Services (HCBS) Conference held in Washington D.C., August 28 – September 1. As a fellow exhibitor, we found this setting perfect for collaboration – with vendors and attendees. By simply listening and conversing with attendees, we learned more from them than we ever expected and hopefully, brought light to some areas of the industry to them as well. This year’s HCBS Conference, which is hosted annually by the National Association of States United for Aging and Disabilities (NASUAD), was the exact place where, as mentioned above, over 1,500 advocates, experts and professionals gathered together. All of which, including federal, state, and local policymakers and those who administer, manage and deliver waiver and other HCBS programs, are working to improve the lives of older adults and people with disabilities. Like the conference highlights and encourages, we were there to share our innovative service offerings and cultivate unique partnerships. Our goal: to be as information savvy and technologically engaging as possible. 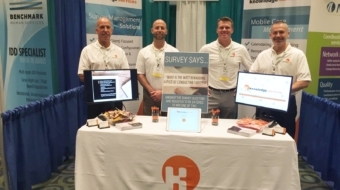 We had prepared a registration login on one iPad, two monitors running presentations and another iPad on hand to walk attendees through our Mobile Case Management application. To support our area, two 9-foot banners stood (shout out to Indy Displays for being so helpful!) with simple bulleted service offerings of both solutions. We found it was more than enough to engage our audience in meaningful conversation. The first night of the conference, we were invited to attend and present at a dinner hosted by the National Core Indicators-Aging and Disabilities (NCI-AD). The NCI-AD is an “initiative designed to support states’ interest in assessing the performance of their programs and delivery systems is order to improve services for older adults and individuals with physical disabilities.” The dinner attendees included leadership and program directors from states utilizing, and benefiting from, NCI-AD programs. During this time we were able to answer a multitude of questions regarding our current services and how we have helped our clients identify areas of cost savings, further improve the process through cutting-edge technology, and meet the expansive needs of initiating and implementing unique workforce initiatives. The next two days, we spent a lot of our time in the exhibit hall where we spoke to several interested parties and industry leaders regarding two service solutions. First, we discussed our Survey Management Solution, which provides state government entities an effective and efficient means of capturing and collecting Patient (Client) data regardless of location. Secondly, we introduced our Mobile Case Management solution which provides State government entities improved transparency of field-based operations, while fundamentally transforming the delivery of those services. The opportunities provided from attending the conference were vast and allowed us to expand our knowledge in the industry. We’re looking forward to continue providing services to our state clients and partnering with them on achieving their goals of improving the lives of older adults and those with disabilities. The conference was an exciting experience for us and reaffirmed our unique workforce management service offerings, in addition to how our partnerships have served to increase efficiencies. You can be sure that we will be back at HCBS in 2017! Want to learn more about these unique offerings? Check out our Mobile Case Management and Survey Management Solutions pages.